“Renewable energy” means energy from natural sources that continuously replenish themselves – such as wind, hydro and solar. There’s a world-wide shift toward those renewable energy sources, because of their key environmental benefit: They don’t emit carbon dioxide (CO2) into the Earth’s atmosphere, unlike burning fossil fuels. Of the 50 states in the U.S., which are the top five leaders in generating electricity from renewable energy sources? It seems to be a simple question – but it turns out that different states make the “top five” list, depending on whether we rank only the raw amount of electricity each state generates from renewable sources; or instead, the percentage of each state’s total electricity that is generated from renewable sources. The rankings also differ substantially, depending on whether or not hydroelectric power is included. Why wouldn’t it be? One reason involves many states establishing “renewable portfolio standards” that require utilities to generate a percentage of their electricity from renewable sources. Since renewable portfolio standards are intended to encourage new renewable energy installations, and many hydroelectric plants were already constructed by the 1930s and have been operating ever since, states often exclude their long-standing hydroelectric plants when setting renewable portfolio standards. So, as we see it, there are at least four different, meaningful rankings of the top five U.S. renewable energy states – and we present each of them below. These rankings are derived from data published by the U.S. Energy Information Administration in 2016. (5) New York – 33,644 gigawatt hours of electricity generated by renewable sources. (4) Oregon – 40,274 gigawatt hours of electricity generated by renewable sources. (3) Texas – 47,956 gigawatt hours of electricity generated by renewable sources. (2) California – 60,359 gigawatt hours of electricity generated by renewable sources. (1) Washington – 83,303 gigawatt hours of electricity generated by renewable sources. In first place above, the most prodigious producer of electricity from all renewable energy sources, is the state of Washington, due in great part to its Grand Coulee Dam on the Columbia River – the largest hydroelectric power plant in the U.S. But as shown below, when hydroelectric power is excluded, the rankings change (and the state of Washington drops from the list). (5) Minnesota – 11,600 gigawatt hours of electricity generated by renewable sources. (4) Oklahoma – 14,341 gigawatt hours of electricity generated by renewable sources. (3) Iowa – 18,139 gigawatt hours of electricity generated by renewable sources. (2) California – 46,498 gigawatt hours of electricity generated by renewable sources. (1) Texas – 47,159 gigawatt hours of electricity generated by renewable sources. 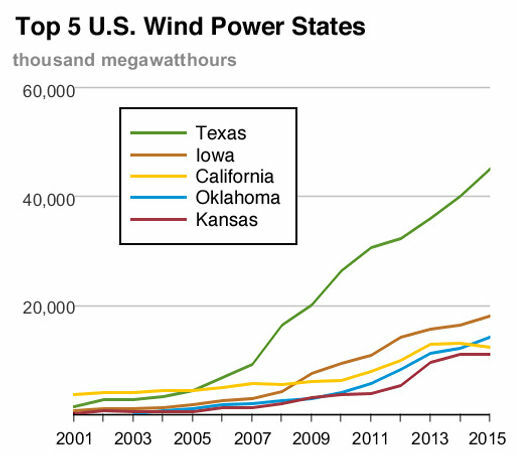 In first place above is the state of Texas, where the overwhelming majority of its renewable energy is produced by wind turbines – 44,959 gigawatt hours of the total 47,159 gigawatt hours. The state of Texas leads the nation in the amount of electricity produced from wind power. At present, the use of wind power is expanding more rapidly than any other renewable energy source. Renewable wind energy is growing throughout the U.S., with Texas producing the most electricity from wind. (5) Oregon – 68.4 percent of state’s electricity generated by renewable sources. (4) Idaho – 74.6 percent of state’s electricity generated by renewable sources. (3) South Dakota – 75.3 percent of state’s electricity generated by renewable sources. (2) Washington – 75.8 percent of state’s electricity generated by renewable sources. (1) Vermont – 99.8 percent of state’s electricity generated by renewable sources. In first place above is the state of Vermont, where nearly all of its electricity comes from renewable energy sources – with the majority (59 percent) from hydroelectric plants. Approximately 21 percent of Vermont’s renewable energy is from biomass power plants, which burn material such as wood to produce steam, which spins a turbine to generate electricity. Wind accounts for roughly 15 percent of Vermont’s renewable energy, and solar photovoltaic is five percent. As shown below, Vermont remains in first place as generating the highest percentage of its electricity from renewable energy sources, even if hydroelectric power is excluded. (5) Kansas – 24.0 percent of state’s electricity generated by renewable sources. (4) South Dakota – 25.5 percent of state’s electricity generated by renewable sources. (3) Iowa – 31.7 percent of state’s electricity generated by renewable sources. (2) Maine – 36.6 percent of state’s electricity generated by renewable sources. (1) Vermont – 40.3 percent of state’s electricity generated by renewable sources. Again, Vermont takes first place, for the highest percentage among all the U.S. states of electricity produced from renewable sources. To be fair, it should be noted that Vermont’s population is the second-smallest among the 50 states, and its total electrical consumption is the lowest of the 50 states. Vermont’s low electricity demand may be one reason why renewable energy sources alone can satisfy most of the state’s energy needs. As the four different rankings above show, renewable energy sources are crucial throughout the U.S. As time marches on, we look forward to more gigawatt hours of electricity being generated, and greater percentages of states’ electricity demands being met, by tomorrow’s renewable energy installations. Remember to follow us on LinkedIn and on our Facebook page and visit our website to have a look at our services.